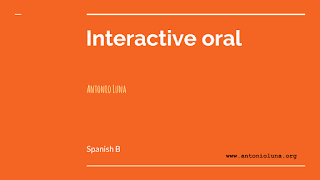 Some useful resources for your interactive oral in class. Rubric included in the activity. If you want to know more about this assessment click here. This work has not been develop and/or endorsed by the IBO. Muchas gracias por compartir!!!! De verdad!!! Eres la caña!!! Gracias Antonio!!! Trabaje "De tapas con los amigos" y les encantó a mis chicos!!! :) Y dime Maribi para los amigos! Gracias Antonio. Voy a probar el material con mis estudiantes y ya te contaré como me va.